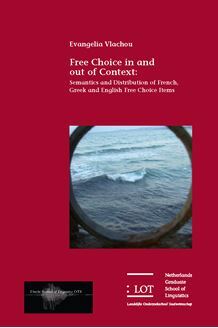 Free Choice Items (FCIs), such as French n’importe qui, Greek opjosdhipote and English anyone, are well known for their limited distributional properties. Most former analyses have been influenced by the polarity sensitivity tradition, accounting for the distribution of FCIs in terms of the conditions of licensing and anti­licensing by the semantics of a given context. Based on French, Greek and English data, this study proposes that FCIs occur in all contexts as long as their lexical semantics is compatible with both the semantics and the pragmatics of the context. Data, mostly extracted from the Free Choice Item Database constructed by the author, show that the majority of FCIs are grammatical in veridical contexts. Consequently, the condition of licensing does not apply to FCIs. FCIs express widening, indiscriminacy, indistinguishability, ignorance, indifference and low­level. These readings can be pragmatically blocked in all contexts. Widening, indiscriminacy, indifference and ignorance can be semantically blocked too. An FCI is ungrammatical if and only if all its readings are blocked. Consequently, the condition of anti­licensing does not apply to FCIs either, because it does not take into account the pragmatics of the context. The distribution of FCIs is, then, entirely free with the exception of certain cases in which semantic blocking is expected. This dissertation is of interest to researchers concerned with the study of FCIs, indefinites, definites and quantifiers, scholars working on more general issues concerning the semantics­pragmatics interface, and linguists interested in cross­linguistic and typological studies.